In order to help evaluate patients who present with chest pain many clinical chest pain scores have been developed. The aim of this post is to: Emergency Department (ED) physicians must assess and risk stratify patients presenting with chest pain nearly every shift. As we all know, acute ischemic coronary syndrome (ACS) is defined as the manifestation of coronary artery disease which is seen as a spectrum from stable angina to STEMI. In certain cases, a diagnosis can be made quickly and easily, particularly in the case of where there are biomarker and ECG changes such as in the case of a STEMI. However, in the absence of these abnormalities, it can be harder to risk stratify patients for both the inexperienced and experienced physician alike. Discuss the medical legal implications surround the utilization and documentation of chest pain scores. However, when ED physicians are asked what they feel an acceptable miss rate is, it appears that is it less than our natural miss rate! Than et al. (2013) conducted a survey of ED physicians, of which 17% were Canadian respondents, and found that the overall consensus of acceptable miss rate for ACS would be approximately 1%. Below is a timeline of the evolution of the major chest pain scores that have been created over the last 15 years. The scores that will be discussed in this post are the TIMI Score, The HEART Score, the North American Chest Pain Score, and the Vancouver Chest Pain Score. Predicts the risk of death, MI, recurrent ischemia requiring revascularization at 14 days. Despite being initially developed for risk stratification of patients with known unstable angina or NSTEMI, this score has been broadly used and validated in several independent ED populations with chest pain. A meta-analysis by Hess et al. (2010) showed a strong linear relationship between TIMI score and incidence of cardiac events at 30 days. 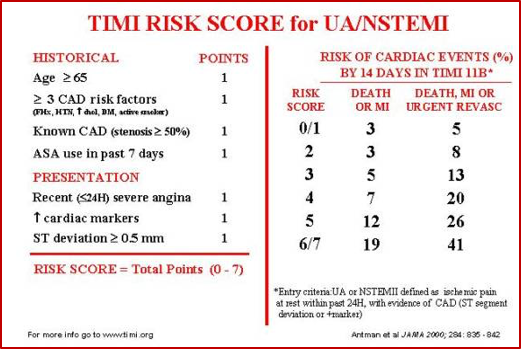 The TIMI score is a well known chest pain score that is familiar to our cardiology colleagues. However, this score was not derived in the ED population and does not have great sensitivity even for a TIMI score of 0. THERE ARE BETTER SCORES TO USE FOR CHEST PAIN EVALUATION IN THE ED. Although this score was derived in a Canadian population, it unfortunately only identifies a low percentage of the population as ‘low risk’ and has not been externally validated. THIS IS NOT A SCORE THAT WE SHOULD BE USING. Initially derived by Christenson et al. (2006) but unfortunately the rule was created using CK-MB as the primary biomarker and never really gained popularity. In 2014, Cullen et al. externally validated the Vancouver Chest Pain rule using TnI as the only biomarker, which is more relevant to how we assess chest pain today. This external validation study showed a strong sensitivity but a poor specificity for the rule using both the contemporary TnI and the high sensitivity TnI. Furthermore, the rule only identified 13% of patients as low risk and eligible for early discharge. The Vancouver chest pain score followed appropriate derivation methodology, has a good sensitivity, and, if used, could enable disposition to be made after 2 hours of ED patient assessment. However, this rule has a poor specificity, is not useful for risk stratifying moderate or high risk patients. It also has not been externally validated in a Canadian population. Ultimately, this is a rule that we CAN CONSIDER USING it BUT I THINK WE CAN STILL DO BETTER. 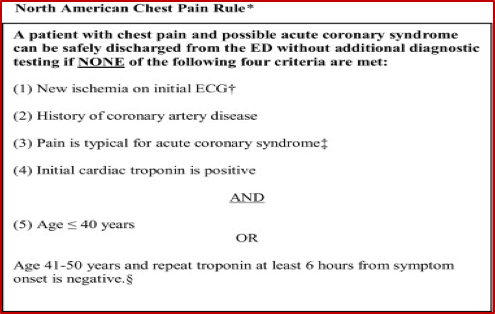 Initially created for patients with undifferentiated chest pain in the ED from a discussion between Dr. Backus and Dr. Six. Goal of the score was for it to be simple and easy to use. First retrospective chart review done in the Netherlands. Findings from this study showed that the chances of reaching a combined endpoint of a MACE at 6 weeks (primary outcome), increased as the HEART score increased. Subsequently, a multicentre prospective external validation study was done in the Netherlands in 2013. Results showed that 36.4% of patients were able to be classified as low risk, and that those classified as low risk had a 1.7% chance of a major adverse cardiac event (MACE) at 6 weeks. It is possible to have a positive TnI or ECG changes and still be considered low risk (score 0-3). In 2011, Mahler et al. conducted a retrospective study in chest pain patients from one tertiary care centre in North Carolina. They looked at a cohort of chest pain patients identified from the emergency department observation unit registry and applied the HEART score. They found that when they grouped people into a ‘low risk HEART score’ they had a MACE rate of 0.6% but if a second delta TnI was added, they were able to capture all MACEs with 100% sensitivity. From this study the HEART Pathway was born (see above). In 2013, the same group conducted another study where they did a secondary analysis on a MIDAS cohort, which was a prospective observation cohort of ED patients enrolled from 18 US sites with symptoms suggestive of ACS who had a high event rate of ACS (22%). In 2015, Mahler et al. published a single centre RCT of 282 patients where they randomized patients to either the HEART Pathway or usual care pathway based on the ACC: AHA guidelines. They looked at many different measures related to efficiency and not relevant to a Canadian Emergency Department setting such as early discharge rate, median length of stay, and decreasing stress test. Overall, from these studies, the research group quotes that low risk HEART Pathway classification (<3 on the HEART score and a 0 and 3 hour TnI that are negative), has under 1% rate of MACE at 30 days. Mahler et al. have created an app can be downloaded at the Apple App Store to help calculate HEART Pathway scores for patients in the ED. Using the HEART Pathway has the same benefits as the HEART Score but also includes a delta TnI. It appears that the low risk HEART pathway has approximately a 1% rate of MACE at 30 days. Unfortunately, the HEART Pathway has not been prospectively validated in other centres and there has been no external validation in a Canadian population. Overall, I think THE HEART PATHWAY HAS THE POTENTIAL TO BE USEFUL BUT I AM INTERESTED TO SEE WHAT FUTURE STUDIES USING THIS PATHWAY SHOW. 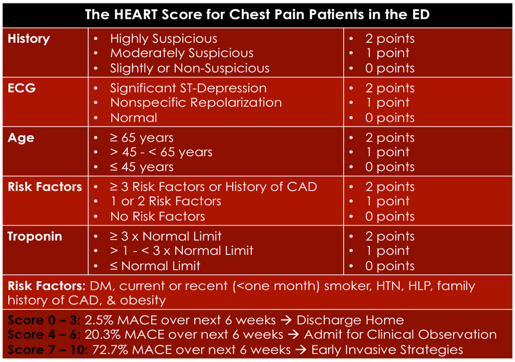 After reviewing many different chest pain scores and highlighting the advantages and also the flaws of these scoring system, at the end of the day can we just use our clinical gestalt instead of these scores? Admittedly, there is very little literature that explores clinical gestalt and the assessment of ACS. However, Body et al. (2014) conducted a study that investigated the diagnostic accuracy of emergency physician gestalt in ED patients with suspected cardiac chest pain. Our clinical gestalt for assessing patients in the ED with chest pain may be quite good for identifying patients who we ‘definitely don’t think have ACS’. However, there is still no study comparing clinical gestalt to chest pain scores in the assessment of ACS. Overall, I think we incorporate clinical scoring systems into our gestalt subconsciously but NEED MORE STUDIES TO DIRECTLY COMPARE CLINICAL GESTALT TO CHEST PAIN SCORES. It is common knowledge that chest pain is a huge medical legal concern in the US but how does that compare to Canada? If you look at CMPA data in EM over the last 5 years, in cases where there is a diagnostic issue, ischemic heart disease is the number one reason for litigation. Consequently, although the rate of physician litigation is far less in Canada than in the United States, medical-legal implications of chest pain scores are still something that we should be aware of. How are chest pain scores and clinical guidelines looked at in the setting of legal hearings? On the CMPA website there is an article that addresses the role of clinical practice guidelines and decision tools in legal proceedings. This article highlights that the CMPA itself does not create nor endorse guidelines or risk scoring systems. However, in court physicians are judged against other physicians who are practicing the same type of medicine. Whether or not using a clinical score or guideline is viewed as the standard of care depends on the credibility and validity of the scoring system itself. Ultimately, it is prudent for physicians to be aware of authoritative clinical practice guidelines and decision scores relevant to their practices. At this time, I don’t believe that using chest pain scores are necessarily the standard of care among ED physicians but they are a Class 2a AHA/ACC recommendation and therefore if you aren’t going to use them in your practice, you should at least be aware of what they are and the evidence behind them that I presented to you in this post! There are many chest pain scores with varying degrees of evidence. HEART Pathway is the only score with approximately a 1% MACE at 30 days. Clinical Gestalt performs well for patients we feel ‘definitely don’t have ACS’ and have negative TnI and ECG. Chest pain scores are not the standard of care but at the moment, but are an AHA/ACC class IIa recommendation. 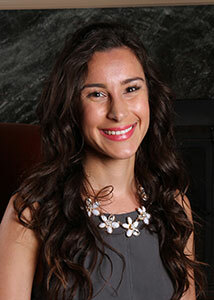 Dr. Samantha Calder-Sprackman is a 4th year Emergency Medicine resident at the University of Ottawa and the current co-chief resident for the RCPSC program. She has a particular interest in patient safety, quality improvement and medical education. 1. Schull MJ, Vermeulen MJ, Stukel TA: The risk of missed diagnosis of acute myocardial infarction associated with emergency department volume. Ann Emerg Med. 2006, 48: 647-55. 2. Than M, Herbert M, Flaws D. et al. What is an acceptable risk of major cardiac event in chest pain patients soon after discharge from the emergency department? : a clinical survey. Int J Cardiol. 2013, 166(3):752-754. 4. Hess, E.P. et al. Diagnostic accuracy of the TIMI risk score in patients with chest pain in the emergency department: a meta-analysis. CMAJ: Canadian Medical Association Journal. 2010, 182(10): 1039–44. 5. Hess, E.P. et al. Development of a clinical prediction rule for 30-day cardiac events in emergency department patients with chest pain and possible acute coronary syndrome. Annals of Emergency Medicine. 2012, 59(2): 115–125. 6. Mahler, S. et al. Identifying patients for early discharge: Performance of decision rules among patients with acute chest pain. International Journal of Cardiology. 2013, 168: 795-802. 7. Christenson J, Innes G, McKnight D, et al. A clinical prediction rule for early discharge of patients with chest pain. Ann Emerg Med. 2006; 47:1–10. 8. Cullen L et al. The New Vancouver Chest Pain Rule using troponin as the only biomarker: an external validation study. Am J Emerg Med. 2014, 32(2):129-34. 9. Six AJ, Backus BE, Kelder JC. 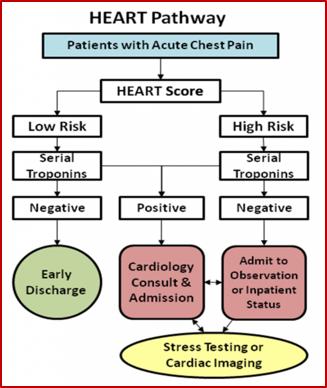 Chest pain in the emergency room: value of the HEART score. Neth Heart J. 2008, 16:191-196. 10. Backus BE et al. A prospective validation of the HEART score for chest pain patients at the emergency department. International Journal of Cardiology. 2013, 168:2153-2158. 11. Mahler SA et al. Can the HEART score safely reduce stress testing and cardiac imaging in patients at low risk for major adverse cardiac events? 12. Mahler SA et al. The HEART Pathway Randomized Trial: Identifying Emergency Department Patients with Acute Chest Pain for Early Discharge. Circ Cardiovasc Qual Outcomes. 2015, 8(2):195-203. 13. Body et al. Can Emergency Physicians ‘rule in’ and ‘rule out’ acute myocardial infarction with clinical judgement? Emerg Med J. 2014, 31: 872-876.